by Elvira Kalviste | THE NIBBLE. Sriracha, a hot sauce that originated in Thailand, has become mainstream in American supermarkets. It is used as a table condiment, a recipe ingredient and a flavoring for snacks like popcorn and potato chips. Conventionally made with red chiles, it has been given a color makeover with green serrano chiles by Musashi Foods. Not surprisingly, it has a different flavor profile. Our resident sriracha expert says it has more of a flavor kick than his usual brand (Huy Fong, a.k.a. Rooster, Sriracha), with a heat that builds. You can buy the 12-ounce squeeze bottle on Amazon for $6.99 with free shipping on orders over $35. So consider these attractive green bottles as stocking stuffers for your heat-loving friends. Musashi Foods has also launched Japanese Spicy Mayo, the condiment used to make spicy rolls at sushi bars. It’s also delicious with crudités, eggs, fries, sandwiches and burgers, seafood and anywhere you’d like some heat in your mayonnaise. It’s the same price and delivery deal as the Green Sriracha, on Amazon. Sriracha, pronounced see-RAH-jah, is a Thai hot chili sauce. It is made from red chiles, distilled vinegar, garlic, sugar and salt; and is aged for three months or longer. Unlike American hot sauces such as Tabasco, which are vinegar sauces that are infused with hot chiles, sriracha is primarily puréed chiles, making it a much thicker sauce. The sauce is named after the coastal city of Si Racha in eastern Thailand, where it was first made and marketed. Different brands can be found in the Asian aisle of many supermarkets and in Asian groceries. According to multiple sources, including an article in Bon Appétit, the sauce was made more than 80 years ago in by a local woman, Thanom Chakkapak. She initially made the condiment for her family, and then for friends, to enjoy with the local seafood (think of it as a much hotter counterpart to American cocktail sauce). As is a common story in the specialty food business, they encouraged her to sell it commercially—and it became the best-selling chile sauce in Thailand. In 1984, Ms. Chakkapak sold her business to a major food company, Thai Theparos Food Products. What’s the correct spelling: sriraja, si-racha, sriracha or siracha? According to Andrea Nguyen, who wrote the article for Bon Appétit: Since Thailand does not adhere to one romanization system for Thai words, many variants have emerged, chosen by manufacturers who have created their own version of the original sauce. However, the most commonly accepted spelling is sriracha. 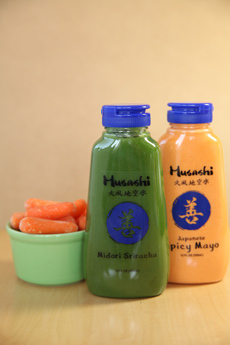 Founded in 2013 in New York City by an entrepreneur with a passion for hot and spicy food and named for the famed Japanese Samurai, Miyamoto Musashi, Musashi Foods is a producer of premium Asian sauces made from the highest quality ingredients. For more information visit Musashifoods.com.